LOS ANGELES, California, April 11, 2015 (ENS) – Los Angeles Mayor Eric Garcetti has released LA’s first Sustainable City Plan, a policy roadmap to prepare Los Angeles for a population growth of 500,000 people over the next 20 years. “We expect at least 500,000 additional people to call our city home by 2035. Our first-ever sustainability plan details actions we must take in the coming months and years to secure a future for L.A. that is environmentally healthy, economically prosperous and equitable in opportunity for us all,” Mayor Garcetti said Tuesday, as he made the “pLAn” public. The plan breaks new ground by making LA’s first commitments in zero emissions goods movement at the Port of Los Angeles, the first commitment to reduce greenhouse gas emissions by 80 percent by 2050, and the first commitment to reduce per capita vehicle miles traveled. “By setting a goal to become the nationwide leader in electric vehicles, Los Angeles can significantly reduce global warming pollution, and lead the country towards a clean vehicle revolution,” Kinman said. The pLAn lays out short-term targets to be met by 2017 and long term targets to be met by 2025 and 2035. If achieved, the targets would make L.A. the national leader in electric vehicle infrastructure, solar energy, water conservation and green jobs. 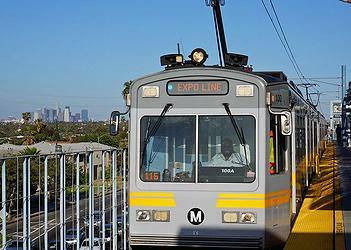 The plan is the product of a year-long process undertaken by LA’s first Chief Sustainability Officer, Matt Petersen. Appointed by Mayor Garcetti when he took office in 2013, Petersen has been tasked with instilling sustainability as a core value across city departments, working with all 37 department heads to incorporate sustainability goals into their annual budgets and performance review metrics. 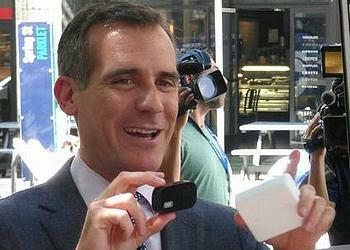 After announcing the pLAn, Mayor Garcetti signed an executive directive incorporating it into city management. He appointed department-level chief sustainability officers who will work with Petersen to achieve the targets. Progress made toward the plan’s goals can be tracked online at: https://performance.lacity.org/sustainability. The success of this initiative rides on the adoption and implementation of the details of the plan not only by City Departments but also by organizations and individual Angelenos who are being asked to “Adopt the Plan”. A broad range of environmental groups are enthusiastic in their support of Mayor Garcetti’s pLAn.